A few months ago, I conducted a reader survey on Pumpkin ‘N Spice that was geared specifically towards you. I asked about recipes you want to see more of, what recipes you want to see less of, new ideas, and things that you love and don’t love, among others. And the response was amazing! I sent out a brief summary to those of you who are regular email subscribers, and I couldn’t be happier with the results. It’s really given me an insight as to what you want to see on Pumpkin ‘N Spice, and I’m working on integrating most of those ideas into this blog. I received numerous suggestions from you to see more meals for one, or single-serve meals. And you know what? I LOVE that idea! 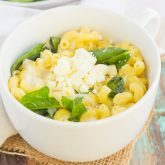 It never occurred to me to share that before, so I’m working on a whole slew of new easy and delicious recipes for those of you who want a meal for one. I’m going to aim for 1-2 “meals for one” recipes per month, and if that goes over well, then it might become a series regular on Pumpkin ‘N Spice. So, what if you’re cooking for a family of four? Or six? Or eight? Not a problem! You can simply double, triple, or quadruple the recipe amounts, and your meal will be family friendly. So, without further ado, I’m bringing you the first “Meal for One” recipe today: Broccoli Cheddar Stuffed Baked Potatoes! 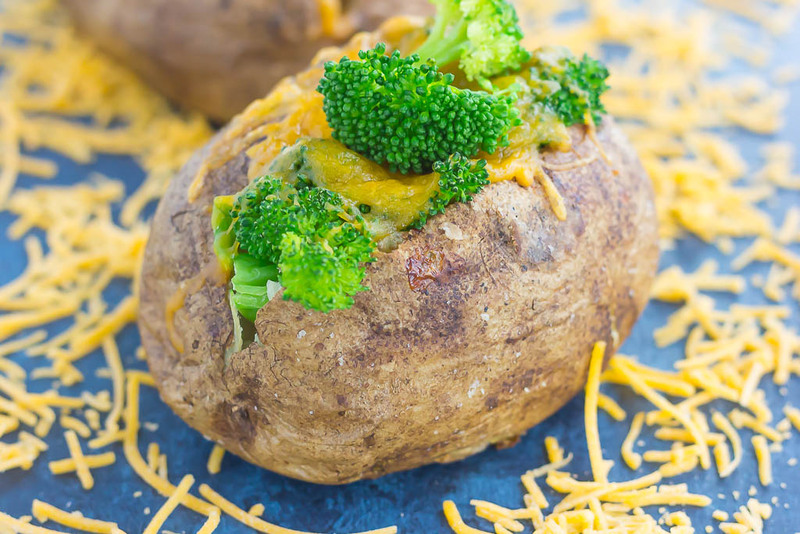 If you’re looking for a new meatless Monday (or Thursday) dish, these Broccoli Cheddar Stuffed Baked Potatoes were made for you. And the ingredients couldn’t get any easier. Russet potatoes, olive oil, salt, pepper, garlic powder, fresh broccoli, and cheddar cheese. That’s it! This makes the perfect “meal for one” because it’s light, flavorful, and so easy to make for just yourself. Or, if you like leftovers or are cooking for someone else, double, triple, or quadruple the recipe. And the prep time couldn’t get any easier! The longest part is baking the potatoes, but after that’s done, these babies are ready in about 5 minutes. I used pre-cut broccoli florets that I found in the refrigerated section of the produce department at my local grocery store. It comes in a plastic bag and can even be steamed right in the microwave. It’s fast and easy….the broccoli cooked in about 2 minutes and was fresh and full of flavor. Pre-cut broccoli florets work well for this dish because you can make as much or as little as you need. If you would rather steam the broccoli yourself, you can definitely do that. I usually steam an entire head of broccoli and then keep it in an airtight container in the refrigerator to use for salads or lunch bowls during the week. The potatoes: if you’re cooking for one, then you’ll just need one russet potato (or more if you would like leftovers). Cooking for more than one? Grab as many potatoes as you need. 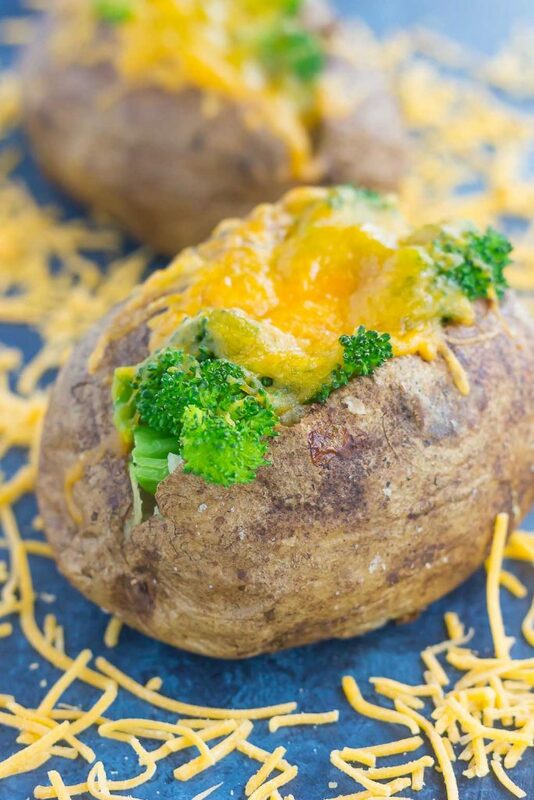 So, grab those ingredients and whip up these easy Broccoli Cheddar Stuffed Potatoes today! If you’re cooking for one, I’d love to know how these turned out! Looking for more easy dinner ideas? I’ve got you covered! Seasoned potatoes are baked until soft and fluffy on the inside and crisp on the outside. 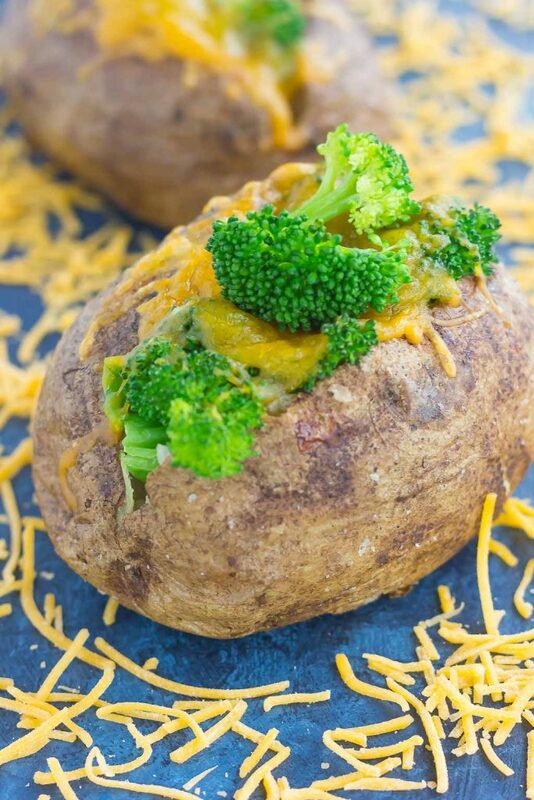 Topped with fresh broccoli and a sprinkling of cheddar cheese, these Broccoli Cheddar Stuffed Baked Potatoes make deliciously easy "meal for one" that's packed with flavor! Preheat oven to 425F. Lightly grease a medium baking pan with non-stick cooking spray or line with parchment paper. Set aside. Rub potato with olive oil, coating all sides, and then sprinkle with salt and pepper. Place onto prepared baking pan. Prick potato several times with a fork on each side. Bake for about 50-55 minutes, or until potatoes are soft when squeezed. Remove from oven and allow to cook for several minutes. If using the pre-cut broccoli florets: steam in bag, prepare broccoli according to package directions. Remove from package after microwaving and sprinkle with salt, pepper, and garlic powder. If using broccoli florets from a head of broccoli, prepare broccoli while potato is baking. Fill a medium pot with about 1/4 cup of water and bring to a boil. Place a steam over pot, add broccoli and cook for about 4-5 minutes, or until tender. Remove from steamer and sprinkle with salt, pepper, and garlic powder. Once potatoes have cooled, cut a slit down the center and pinch ends to make a wide opening. Add broccoli to inside of the potato, then top with shredded cheese. Return to the oven and back for about 5-7 minutes, or until cheese has melted. Okay...I SWEAR that I'm not reading your mind or copying your recipes! 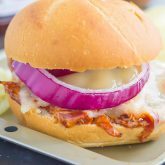 I have a post scheduled with a very similar recipe, except my version includes chicken as well. :) Aren't they delicious (and easy)? Great minds think alike, Gayle! Great minds definitely do think alike! :) Thanks, Blair! I loooooove broccoli and cheddar in my baked potatoes! This looks like a perfect way to do Monday dinner the easy way! I think even my pickiest eaters would love it! Baked potatoes for a Monday night meal is definitely the best. Thanks, Sarah! What a great idea, Gayle! This would be an awesome regular thing to have! Sometimes it's hard cooking a 'regular' portioned recipe cause there are many leftovers, but this way you can make it, eat it and forget it, ya know? 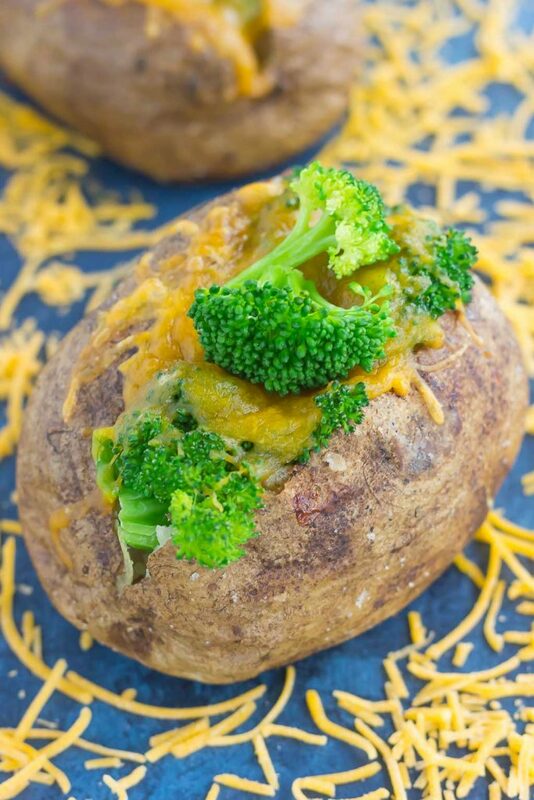 I love baked potatoes and cheddar and broccoli go together so perfectly! I'd even love this for lunch. And so awesome for Meatless Monday. Pinned, of course. Happy Monday to ya! Thank you, Dawn! I love cooking easy meals for one if my husband is traveling, or I just feel like eating something different. And baked potatoes are so easy to customize, too! Thanks for the kind words and for stopping by, Deborah! Meals for one is a brilliant idea, Gayle! Boy and I often eat two different dinners, which means I am normally cooking 2 meals for one... or at least 1 meal for one if I have popcorn for dinner. LOL! :) Anyways, broccoli and cheese stuffed potatoes was one of my FAVORITE things to eat for dinner growing up! Seriously, I would beg my mother to make me 'taters stuffed to the gills with broccoli and cheese, so these babies are making me reminisce. And they are making me so SO hungry! I'm thinking I need to add these to the rotation ASAP! Pinned of course! Cheers, girlfriend! Thanks, Cheyanne! I often eat a different meal than my husband too, mainly because I don't really like leftovers! :) But these potatoes solves the trick! Thanks for the sweet comment and pin, friend! I usually make doubles of everything too, but sometimes you just need one, not five, right? :) Thanks for the kind words and pin! Even with my family of four, there are times when single serve meals come in handy. Sometimes I only have enough leftovers for 2-3, etc. I love this baked potato and it's the perfect thing for the broccoli in my garden! I'd gladly eat this for dinner or lunch and it's perfect portion control! Oh I bet the broccoli fresh from your garden is SO good! Thanks for the kind words, Marcie! Just today my hubby was saying he's craving a loaded baked potato! This will fit the bill beautifully! These cheesy potatoes are my perfect lunch (or dinner), Gayle! 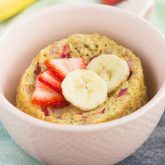 I love that they're easy, healthy, and can be made to serve one or more! Thanks for the potato love, Kristine! I would double it even if only cooking for myself:) ..which never happens. Can't go wrong with these and a Helles or a Pils. Love everything about these potatoes! The combination with cheddar and broccoli is so delicious! Can't wait to try them! I like the idea of meal for 1 recipes, you know sometimes you only need to cook for yourself! Love these potatoes, broccoli makes them so much better! Love the idea of meals for one! That is exactly what I need because my husband is a meat eater while I am all about the greens. So these yummy potatoes with broccoli are my perfect lunch or dinner! I loveee stuffed potatoes! They are a favorite of mine when the husband is traveling for work! 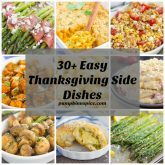 Such a great idea for a series - even though I usually cook normal sized meals I love having options for when it's just me! Thanks for the potato love, Ashley! What a nice way to reach out to your readers! I love single serve meals especially for those things that I know I would love but my fiance would give a no go. More for me I used to say! Now I can make just what I like for my work lunches! I love a good baked potato anytime too, so this recipe is perfect! Thanks, Shelby! You are right, these would be perfect for lunches! Hi Archi! You eat like a regular baked potato, eat the broccoli on top and then dig into the rest.